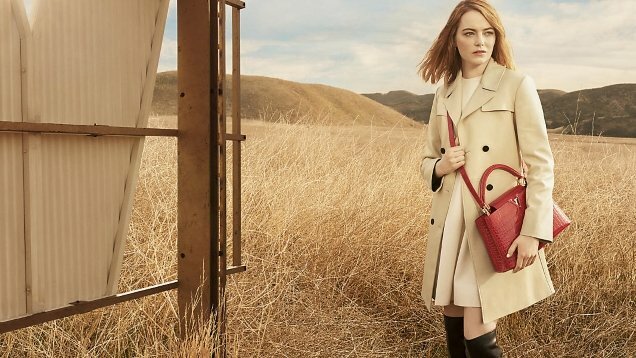 If you haven’t heard already, Emma Stone is Louis Vuitton’s latest brand ambassador, becoming Nicolas Ghesquière‘s newest muse and clothes horse. The first major outing from the actress as the face of the legendary French fashion house arrives in the form of the new ‘Spirit of Travel’ campaign for 2018, photographed by Craig McDean. Giving Alicia Vikander the push, Emma ventured out into the California desert for the shoot, roaming around a large purpose-built V monument with the rugged landscape making for a nice contrast against Vuitton’s luxurious Capucine handbags. Unfortunately, our forum members weren’t too impressed. “Coach? Calvin Klein?” asked Conbothsides, suggesting the campaign didn’t look or feel on-brand. “Coach + Calvin Klein = Louis Vuitton. Seriously though, this is so uninspiring it puts me to sleep. I remember those Annie’s shots which actually sent me somewhere but my bed. The images are fine. But for a brand that is Louis Vuitton, I expect more,” voiced TaylorBinque. “Well, this landed with a resounding thud. After all the hype this is it?” quizzed lelaid. “NO SPIRIT!!! Spirit should be about fantasy, not celebrity and product. So annoying,” scolded gazebo.